Some of the earliest depictions of dreadlocks date back as far as 3600 years to the Minoan Civilization, one of Europe's earliest civilizations, centred in Crete (now part of Greece). Frescoes discovered on the Aegean island of Thera (modern Santorini, Greece) depict individuals with braided hair styled in long dreadlocks. here were priests with long robes of black cloth... The hair of these priests was very long and so matted that it could not be separated or disentangled, and most of them had their ears scarified, and their hair was clotted with blood. Maasai warriors are famous for their long, thin, red locks. Many people dye their hair red with root extracts or red ochre. In various cultures what are known as shamans, spiritual men or women who serve and speak to spirits or deities, often wear locks. In Nigeria, some children are born with naturally locked hair and are given a special name: "Dada". Yoruba priests of Olokun, the Orisha of the deep ocean, wear locks. Another group is the Turkana people of Kenya. 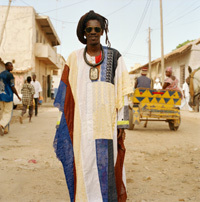 In Ghana, the Akan refer to dreadlocks as Mpɛsɛ, which is the hairstyle of Akomfoɔ or priests and even common people. Along with the Asante-Akan drums known as Kete drums, this hairstyle was later adopted by Rastafarians, with roots in Jamaica from the slave trade era. Hindu Vedic scriptures provide the earliest known evidence of dreadlocks. Locks are worn in India by Sadhus or Holy men. The Nagas are ascetics and followers of the god Shiva. They wear their Jaata (locks) above their head and let them down only for special occasions and rituals. Jaata means twisted locks of hair. Indian holy men and women regard locks as sacred, considered to be a religious practice and an expression for their disregard of vanity. Within Tibetan Buddhism and other more esoteric forms of Buddhism, dreadlocks have occasionally been substituted for the more traditional shaved head. The most recognizable of these groups are known as the Ngagpas of Tibet. For many practicing Buddhists, dreadlocks are a way to let go of material vanity and excessive attachments. Dreadlocks were required for many esoteric Buddhist rituals in medieval South Asia performed by Buddhist yogis (Buddhist counterparts to contemporary Hindu sadhus). For instance, 1.4.15 of the Hevajratantra states that the practitioner "should arrange his piled up hair". In contemporary Tibetan practice matted hair is replaced by crowns with matted hair attached to them. When reggae music gained popularity and mainstream acceptance in the 1970s thanks to Bob Marley's music and cultural influence, the locks (often called "dreads") became a notable fashion statement worldwide; they have been worn by prominent authors, actors, athletes and rappers. Dreadlocks have become a popular hairstyle among professional athletes, ranging from Larry Fitzgerald's dreads down to his back to Drew Gooden's facial dreadlocks. With dreadlocks style in vogue, the fashion and beauty industries capitalized on the trend. A completely new line of hair care products and services in salons offer all sorts of dreadlock hair care items such as wax (considered unnecessary and even harmful by many), shampoo, and jewelry. Hairstylists created a wide variety of modified locks, including multi-colored synthetic lock hair extensions and "dread perms", where chemicals are used to treat the hair. In the West, since gatherings of hippies became common in the 1970s, dreadlocks have gained popularity among Caucasian, counterculture adherents such as hippies, crust punks, New Age travellers, goths and many members of the Rainbow Family. Members of the cybergoth subculture also often wear synthetic dreads or "dreadfalls" made of synthetic hair, fabric or plastic tubing. Traditionally, it was believed that in order to create dreadlocks in non afro-textured hair, an individual had to refrain from brushing, combing or cutting. This lack of hair grooming results in what is called "free form" or "neglect" dreads, where the hair matts together slowly of its own accord. 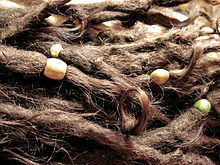 Such dreads tend to vary greatly in size, width, shape, length, and texture. 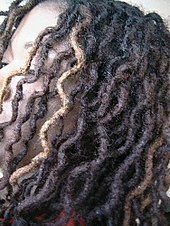 If the wearer is interested in any uniformity of their dreads, they must pull the matted strands of hair apart to ensure large clumps don't form. All that is needed alongside the regular separating of sections is regular washing; oily dirty hair will slide along each other and never form knots. Some people will spray a water solution with added sea salt and essential oils to dry the hair and accelerate the matting process. A variety of other starter methods have been developed to offer greater control over the general appearance of dreadlocks. 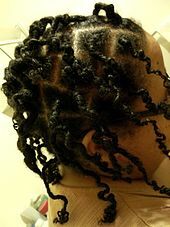 They can be formed through a technique called "twist and rip", as well as backcombing interlocking and palm rolling. Together, these alternative techniques are more commonly referred to as "salon" or "manicured" dreadlocks. Using beeswax to make dreads can cause problems because it does not wash out, due to the high melting point of natural wax. Because wax is a hydrocarbon, water alone, no matter how hot, will not be able to remove wax. This is often where problems like mold and dread rot come from, the wax clogs inside the length of the dread meaning water can't run out easily. Having wet dreads for long periods of time helps mildew set in, this combined with the wax and every dirt/dust/fluff particle that has stuck to the wax can result in moldy, slimy dreads. As with the organic and freeform method, the salon methods rely on hair naturally matting over a period of months to gradually form dreadlocks. The difference is in the initial technique by which loose hair is encouraged to form a rope-like shape. Whereas freeform dreadlocks can be created by simply refraining from combing or brushing hair and occasionally separating matted sections, salon dreadlocks use tool techniques to form the basis of the starter, immature set of dreadlocks. A "matured" set of salon dreadlocks won't look the same as a set of dreadlocks that have been started with neglect or freeform. There is also the ability to adopt different types of fake dreadlocks that may make the hair look as real as possible. This process is called synthetic dreadlocks. There are two different types of synthetic dreadlocks. The first is dread extensions, in which other hair can be infused with the wearer's own hair. The second is dreadfalls, in which one dread is tied into another with either elastic or lace. Both of these methods are used to make dreads look better and more appealing, and to achieve the desired effect of longer hair. ^ a b c d BLENCOWE, CHRIS (2013). YRIA: The Guiding Shadow. Sidewalk Editions. p. 36. ISBN 9780992676100. 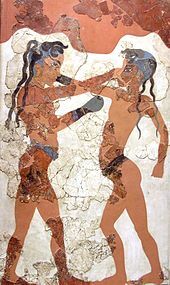 ... Archaeologist Christos Doumas, discoverer of Akrotiri, wrote: “Even though the character of the wall-paintings from Thera is Minoan, ... the boxing children with dreadlocks, and ochre-coloured naked fishermen proudly displaying their abundant hauls of blue and yellow fish. ^ "Image of Egyptian with locks". freemaninstitute.com. Retrieved 6 October 2017. ^ Egyptian Museum -"Return of the Mummy. Archived 2005-12-30 at the Wayback Machine Toronto Life - 2002." Retrieved 01-26-2007. ^ "plaits". www.ancient-origins.net. Retrieved 6 October 2017. ^ Gabbara, Princess (2016-10-18). "The History of Dreadlocks". EBONY. Retrieved 2019-02-25. ^ Sekunda, Nick (2002). Marathon 490 BC: The First Persian Invasion of Greece. Osprey Publishing. p. 40. ISBN 978-1-84176-000-1. The ephors were members of the 'Spartiate' class who were noted for the uniformity of their dress, and their archaic hairstyles. They continued to wear long hair, a fashion long dead elsewhere among Greek aristocrats. The hair was braided into long locks all gathered together at the back, sometimes with a couple of locks allowed to fall lose. ^ "The diverse cultural & personal meanings dreads have for their owners..." 2016-04-04. Retrieved 2016-09-07. ^ "Students are claiming the white man harassed over his dreadlocks isn't telling the full story". The Independent. Retrieved 2018-07-18. ^ "Dada or dreds – Neologisms". ^ "Matz: NFL players embracing long hair". ESPN.com. 29 December 2010. Retrieved 6 October 2017. ^ "Fromgrandmaskitchen.com". fromgrandmaskitchen.com. Retrieved 6 October 2017. ^ Staff, Guardian (2003-08-23). "Dare to dread". The Guardian. ISSN 0261-3077. Retrieved 2019-02-22. ^ "Hippies with Dreadlocks and why I quit Reggae". Grave Error. 2006-08-01. Retrieved 2018-04-06. ^ Cherish Marasigan (2018-06-14). "Intro To Cyber Goth: Goth'S Futuristic Side". Rebels Market. Retrieved 2018-06-14. ^ "Longest Dreadlock Record – Rested". Archived from the original on 2011-10-05. Look up dreadlocks or dreadlock in Wiktionary, the free dictionary. 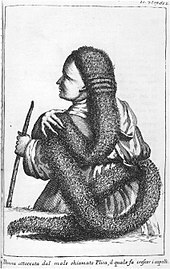 Wikimedia Commons has media related to Dreadlocks.